Charley Hoffman first fell in love with Las Vegas while attending UNLV as a member of the Rebels golf team, a perennial national powerhouse. Hoffman was a part of the 1998 team which won the NCAA Championship, and will forever be linked to one of the greatest teams in the history of all UNLV sports. In college, Hoffman adhered to the strict regimen of UNLV Golf Head Coach Dwaine Knight, himself a Las Vegas Golf Hall of Fame inductee, but he was also known as a free spirit and for his go-for-broke playing style. Following his career at UNLV and some challenging times on golf’s mini-tours, Hoffman made his long hitting and fearless style payoff when he earned a full-time spot on the PGA Tour in 2006. 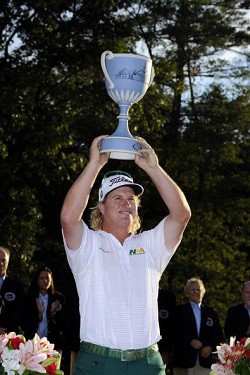 He then went on to win the 2007 Bob Hope Chrysler Classic and the 2010 Deutsche Bank Classic, and has become one of the most recognizable players on the PGA Tour who is known for his long, blonde surfer hair and sense of humor. Hoffman, along with his childhood friend and college teammate Bill Lunde, lives in Las Vegas with his family, and has dedicated his time and money to making a difference in the community. Charley and his wife, Stacey, created the Charley Hoffman Foundation and have helped raise money and awareness for several Southern Nevada charitable organizations. "It feels great to be able to give back to a community that has supported me and my golf career since college," says Hoffman. "I wouldn't be who I am without the PGA Tour and Las Vegas.” Hoffman has earned more than $10 million in his PGA Tour career through mid-2012.